Many believe that a woman’s handbag is a bottomless reservoir that can accommodate anything and everything! Sure, men may complain that it takes forever to find something in a woman’s purse, but at least you know it’s there and is going to serve a purpose, right? It’s always better to prioritize, though, and weigh those shoulders down with things that are worth it. Also, imagine stuffing everything you can think of into the purse only to realize you’re missing the only thing you end up actually needing! Save yourself from such worries and go through our list of purse essentials for every woman! No point in guessing why this tops our list of purse essentials! No matter where you are, hand sanitizer will come to your rescue after a long drive, before you grab a bite, when the kids are coming out of the playground, after contact with someone who’s ill, after using public transport, and plenty of other everyday situations! Small and easy to carry, this is one item that should have a permanent space in your handbag. a. Sunscreen – This is the all-important accessory that women cannot, and should not, do without! From early aging signs to wrinkles, prolonged exposure to the sun can play havoc with a woman’s skin. What’s more dangerous is that, in extreme cases, it can also cause cancer. Experts recommend re-applying sunscreen every 2-3 hours, so make sure you always have a small tube or bottle of sunscreen in your purse. b. Lip balm – One small stick can easily fit into any small beauty kit, therefore the lip balm’s place on the list of beauty essentials is now indisputable. Say goodbye to chapped lips and instantly add a dash of glamour to your look with lip balm. Ensure that your lip balm also has an SPF around 20 and perhaps a tint of color – pink, red, or whichever shade you like! c. Mirror – This one’s a definite must-have in your purse. From checking yourself just after a meal at a restaurant, to giving yourself one final look over before your date with friends, the mirror is a life-saver! d. Moisturizer – We’re using our hands for everything that we do, but we seem to ignore giving them the attention they deserve. Always carry around a small sample or bottle of moisturizer and use it every few hours, especially after you wash your hands. e. Wipes – Whether you just need to wipe your hands or your friend has spilled something that needs to be quickly wiped off, wipes can come in handy. Carry these with you to clean up quick messes and remain clean all day long! f. Perfume – We’re all always running around – to the grocery store, to pick kids up, to meet friends, to do some quick shopping – the list is endless! Spray on some perfume and smell fresh no matter how long you’ve been outdoors or what activities you’ve been busy with! g. Feminine products – While it’s neither a beauty nor a skin essential, you must be always prepared for that time of the month. Make sure you carry a tampon or two on you always. It’s sure to come in handy – for you or a friend – and save the day! When it’ comes to choosing purse essentials, it all comes down to how functional the item in question is. The Swiss Army Knife is a very useful tool to carry around. Small and portable, tools like these take care of many things at once and reduce the amount of clutter in your purse. From a knife to a can opener, this multipurpose tool has it all! The first aid kit is an integral addition to any list of purse essentials. Whether it’s pills for a common headache or band aids, it’s important to be armed with a first aid kit in case of an emergency. You don’t want to walk out of a movie theater because of a splitting headache, do you? Don’t underestimate the value of each of the small items you choose to put into this first aid kit. Someday, you’re sure to be thankful for this weight you’re lugging around! Some of you might think this is a stretch. After all, you can stop anywhere to grab a quick bite, can’t you? But what if you’ve been stuck in a long traffic jam and you really could use a snacj? A granola bar and a small bottle of water can keep you going and give you the necessary amount of energy! Items like these will also come in handy if a friend is feeling faint, or the kids are being difficult and need a quick snack to calm them down. We take great care to collect coupons and save on our monthly shopping bills, but imagine making an unscheduled stop at the store to pick some things up and not having your coupons! Make sure that you bundle up all your coupons neatly, so they don’t take too much space, and dedicate a spot in your purse for them. You’ll always be ready for that unplanned supermarket shopping spree! After all, a list of purse essentials is incomplete if the items do not accommodate for some unplanned shopping! 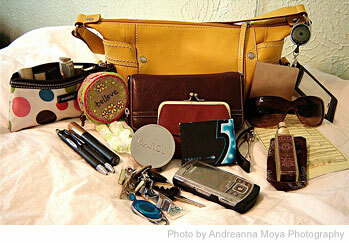 What is a list of purse essentials without mentioning the wallet and the ubiquitous cell phone? You certainly do not want to be stuck somewhere without paper and/or plastic cash! Since most of us keep our ID cards in our wallets, it is important to make sure that you have your wallet before you leave home. Your identification cards are especially useful in cases of emergencies. For many of us today, the cell phone is much harder to forget. So carry these two things along with you and solutions to all kinds of problems are just a call away! There are many other items that might be important for you – chewing gum, pen, a small diary, etc. Don’t hesitate to add them to this list of must-haves in your purse. You never know what can come in handy!